W. Haut Specialty Co. Company Profile - W. Haut Specialty Co., Inc.
Willard Haut founded W. Haut Specialty Co. in June, 1960, at 5248 North 124th Street in Milwaukee. Mr. Haut had a vocational/technical education background and a wealth of experience in the Milwaukee area tool & die industry. He was gifted in mathematics and in the ability to ‘see’ the design of a tool. Mr. Haut worked with the firm through 1994, never retiring. In 1990, the operation moved to larger quarters (from 4,800 square feet to 12,000 square feet) on Silver Spring Drive in Menomonee Falls. The third and last move of W. Haut Specialty Co. was right across the street – to Silver Spring Road (26,000 square feet) occurred in 1997. Click here for directions. 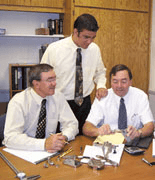 2nd and 3rd Generations of W. Haut Specialty Co. From left to right: Paul Haut, Michael Haut and John Haut. Willard’s sons, John & Paul, succeeded him in the business. 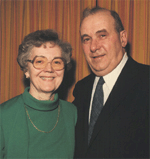 Both sons formally started with the business at 16 years old, in 1964 and 1970, respectively. John Haut retired in 2015. Paul Haut, President W. Haut Specialty Co.
Paul Haut (paulh@wHaut.com) runs Manufacturing & Operations. Paul earned his B.A. in Business Administration at Wisconsin State University in Whitewater, June 1975. Paul is active in the industry and community and church. He is a member of the Tool & Die Machining Association of Wisconsin. He is active, currently as a board member, with Lutheran Special School, and Committee Member of the Milwaukee Lutheran “School To Work Program”, and Martin Luther Golf outings. He and his family are active members of Elm Grove Lutheran Church in Elm Grove, Wisconsin. Paul’s son Michael begins the third generation of active members in this family-owned enterprise. Michael leads the water jet cutting segment of the business and also handles purchasing, quoting, and IT.